Q&A Silvia Bifaro - from fashion to food. Silvia Bifaro, the person behind Salvia Limone started out working for brands like Versace, but the stressful environment made her turn back to her roots and passion for food. "I would like to say so. But actually it is not. We are still consuming too much and irresponsibly, so veganism is only a part of a wider set of choices we need to make in order to preserve this planet. Furthermore there is nothing extreme about making a choice and persevere, it is an act of responsibility." "I grew up in Italy, in a small town by the sea called Rapallo, between Portofino and Cinque Terre. Pretty lucky I would say. I love this part of Italy and its nature. My parents had a restaurant before moving on to a different business. My mum was also a painter. I got my skills from her, but the passion from my dad, and from both (I hope) endurance . In our home food was always a big topic, even for the everyday meals my mum arranged everything beautifully, from boiled vegetables to a lasagna. My parents still managed to get involved with food in their business, so I grew up among fine restaurants and chefs. Back then I was used to throwing my own supper clubs, before that was even a thing. Every month I cooked a theme dinner in my parent's home, and my high school mates were seriously paying me! On every Sunday my grandmother or my mum would make ravioli or gnocchi or lasagna, or any kind of delicacy, my mum is a very inventive and skilled cook. My dad is also a good cook, but way too messy for the survival of their marriage, so I guess he gave up the cooking, he takes care of the table arrangement for the celebrations and he is impeccable. Personally I started cooking around 16, when I found a macrobiotic shop in my town, they taught me how to make sushi and miso soup. However I had no idea what macrobiotic was until more than ten years later." Q: You have been working with fashion - and as a photographer assistant for interior magazines like Marie Claire but changed your direction into food and trained as a Macrobitotic Chef - how come? "Yes it has been quite a roller-coaster! It hasn't always being a straight path, nothing came easy in my life but I can say without being arrogant that I worked super hard to acheive my goals. I went to study fashion in Milan, and started working for a top sportswear brand. I loved my job. But it was also an eye opening experience on how much plastic material we actually consume. The stressful environment triggered eating disorders. Something about my beloved career was never quite right for me. During my days in the fashion industry I also wrote for an art magazine and participated in art shows. To learn more I attended a professional photography evening course at university. (Where I also met my husband). I declined a job offer at Benetton as manager for bags and accessories, and decided to move on with photography at Marie Claire instead assisting an interior photographer and stylist, both very talented and good women, that I am lucky to still call my friends. 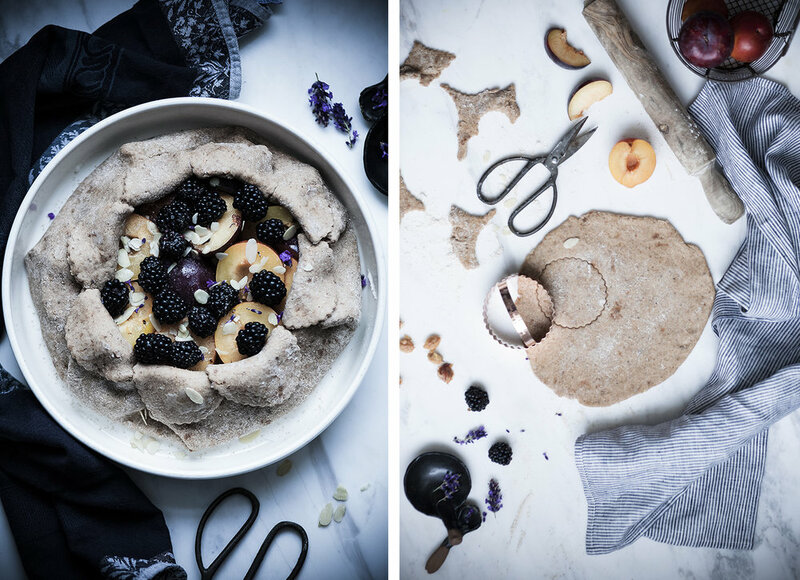 The stylist introduced me to macrobiotic food and my path out of the eating disorders began. Once in London, my emotional health felt still precarious so I decided to attend a proper course and earned my degree as a Macrobiotic Chef. In the meanwhile I was having my 2 children. It was 3 years of self development and healing, and finally I grew my self aware and inner consciousness in ways I couldn't imagine before. I did not feel like becoming a macrobiotic consultant ( I developed my personal view on macrobiotic, and I do not agree on the full philosophy). 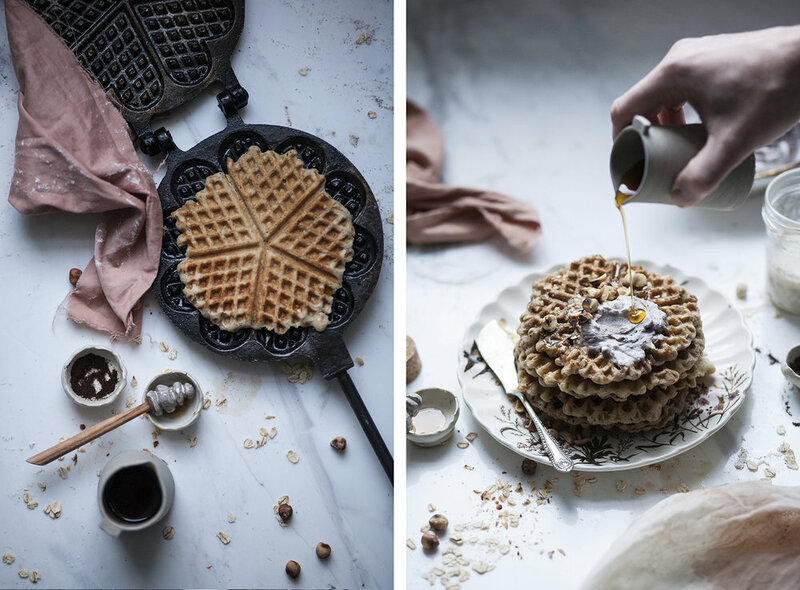 As cooking wasn't enough for me, I easily get stagnant, I merged my skills photography + cooking and I could immediately feel the bliss." "I believe in eating unrefined food, local and seasonal. It's the key for physical and mental heath and for the survival of our planet. In our society the connection with food is both physical and emotional and is a complex scenario. But for many people health is beyond their control or awareness, so judgment is something I do not allow to rise in myself and I don't tolerate it in others. I believe education is essential." Proteins are everywhere in plant food. I just keep a good weekly variety." Q: ”Vegan food contains a lot of gluten” - Do you find this a true statement? "Not really! Our sources of gluten are pasta, seitan and some cakes (of course! ), we consume them not more than once a week. We eat a large variety of grains, legumes, vegetables and fresh fruits. I also mill my own flours at home, we have a german stone mill and make a wide variety of flours from any sort of rice, oat, barley, quinoa and wheat. I am not against gluten btw, as we rotate our foods so much, our diet is pretty low in gluten compared to someone that eat sausages, burgers, ice creams and pre-packed meals that often have hidden both soya lecithin and gluten. We also limit our use of those ingredients that travel many many miles to reach our table." Q: Isn’t it more complicated to cook vegan food than meat and potatoes? "Mediterranean cooking is more plant based by default. I do not find it particularly challenging. I presume is just about be willing to do it."" Q: What do you think about Climate Change? "If you would have asked me what is my biggest nightmare, this is it! Climate change and the survival of our planet, this feels so beyond my direct control. Anyway yes, it is freaking visible. I am 35, and at the age of 6-8 I was going ski on the Apennines over Rapallo. There has been no sign of snow there for 20 years at least. It is simply so sad that we polish our beautiful homes and forget that our true home is this planet that we mistreat so much. Once it is ruined there will be no cheap replacement for our kids at the shopping mall." "Being a fair person and a compassionate mother. And, when I am behind my camera." 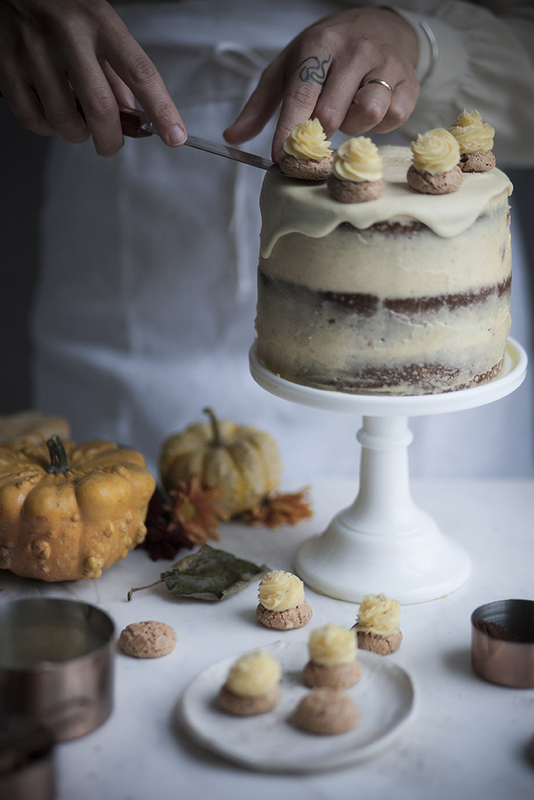 Pumpkin Coffee Cake with Mascarpone Amaretti frosting and White Chocolate. 3 cake tins (12 cm ø) springform or loose bottom. A powerful food processor. 2 Mixing bowls. Again in a powerful food processor make the cashews into a smooth cream, with the vanilla, coconut oil, add the salt and the sugar. Taste for sweetness. Let the cashew cream cool in the fridge. Meanwhile wash and cut half of a large pumpkin into small cubes( always better roast too much and use the leftover in a stew or something). Roast the pumpkin with a pinch of salt and 1 Tbsp olive oil, for 30 minutes at 200°C. Blend the pumpkin into a smooth cream (you need 3/4 cup puree). Place in a airtight container and leave in the fridge overnight (at least) to set into a perfect consistency of a mascarpone cream. If you have any problem with consistency gently pulse again with the addition of 1 Tbsp coconut oil and½ tsp Xatham Guar, and leave to set againin the fridge for couple of hours. However if you drain the cashes well and the coconut yogurt is firm, you shouldn't have any problem at all.